The Department of Mental Health and Behavioural Sciences at Fortis Healthcare in collaboration with FICCI organized a seminar on "Depression Let's Talk" on 7th April. The panelists included experts from the Ministry of Health, NITI Aayog and medical heads and practitioners from public and private healthcare. Twitter and Facebook campaigns were launched which created 75 million impressions, 6000 conversations and 5.8 million. These included live chats and a twitter based seminar. A daily campaign was run on the Fortis Healthcare Facebook page with daily posts on varied aspects relating to Depression as well as a daily poll on myths and facts relating to Depression. Campaign was run with the online parenting portal Mycity4kids.com which included publishing of blogs and Facebook live chats receiving 2,50,000 views. School campaign was run in Delhi-NCR, Mumbai, Kolkata, Jaipur, Ludhiana, Amritsar, Udaipur, Bengaluru, Mohali. School talks in 30 schools were conducted on "Depression: Let's Talk"reaching 50,000 students. Talks on "Coping with Peer Pressures"were conducted in 42 schools reaching 10,000 students and 4000 teachers. The Prosocial Peer Moderator Program on "Media Literacy was conducted which was attended by 75 schools and 300 students who in turn further conducted the program in their schools reaching 1,50,000 students. Expressive Art Based Therapy workshops were conducted with 300 senior delegates from South-east Asia at the head office of WHO in conjunction with a talk on the treatment of depression. A workshop was conducted at an Old Age Home with 30 senior citizens to enhance well-being with a team from WHO. 16 CMEs on "Depression: Clinical Insights, From Prevention to Management"across all zones. The forum was instrumental in discussing strategies to prevent as well as manage Depression. It was attended by more than 1000 doctors and staff from various departments across all Fortis hospitals where the events were held. Two national webinars were organized through which corporate employees across the country were addressed on the importance of mental health and well-being, building awareness related to depression and its treatment. 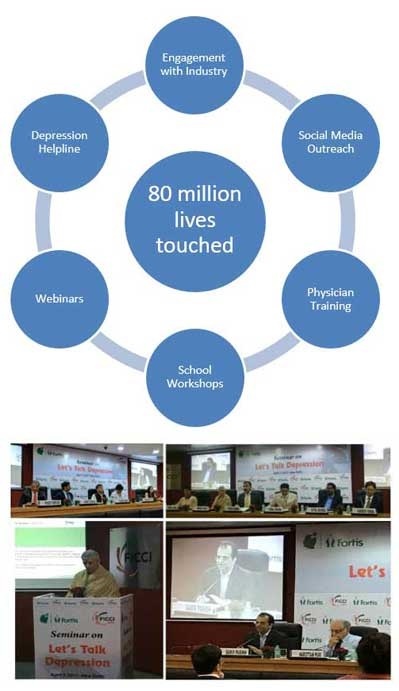 These webinars received participation from 30 corporate organizations from 10 cities in India reaching out to 10,000 employees. Health talks for corporate organizations across Delhi-NCR, Mumbai, Kolkata, Amritsar and Bengaluru were also conducted at their premises. The webinars were attended by over 10,000 employees and talks by 5500 employees. The Fortis National Depression Helpline offered guidance and support seven days a week from 9am to 5pm. We have been receiving an average of around 50-150 calls per day on the helpline. On the occasion of World Health Day, a support group was conducted for the 50 caregivers of patients diagnosed with depression at Fortis Anandpur, Kolkata. A multi-city survey was conducted to gain insights into society's attitude towards mental health in India. A sample of 3194 men and women from across Delhi-NCR, Bengaluru, Kolkata, Mumbai, Jaipur, Mohali, and Ludhiana was sought and was published in The Hindustan Times.